The digital transformation promises new business models, increasing profits, and numerous simplifications in our everyday lives. Besides the many opportunities there are also challenges that must be taken seriously. Those challenges are typically non-technical, concerning social implications of living with algorithms. Fears that were described in science fiction long time ago such as autonomous algorithms that take control over humans in different aspects come close from a technical point of view. Partly they are already reality today, requiring a responsible use of the available technology. Not long time ago, big data with collecting and processing huge amounts of data in short time was technically unimaginable. Today, searching big data stores in almost real time, and at a high semantic level is reality. Examples are the image analysis algorithms used by Facebook to tag friends, and to semantically analyze content of just uploaded pictures. Artificial Intelligence also made a big leap recently with machine learning and deep learning enabling applications such as automated and autonomous driving or autonomous robots that will both be part of our daily reality soon. The increasingly fast evolution of algorithms raises questions that we consider worth discussing: Who takes responsibility for unplanned side effects? Can we meet our responsibility by implementing safeguards against the misuse of algorithms? Computer scientists can no longer focus on a purely technical view of the world only. Societal implications have to be taken into account early in their work. What does being human mean in a world that is more and more dominated by physically interacting, self-learning algorithms? What role should humans play in the future world? Is everything that is feasible also desirable? Is it justifiable? Do we have to re-define society for our lives with algorithms? Computer science cannot give answers to those and many more questions that clearly go beyond the classical expertise of the field. It becomes more and more important to identify, discuss, and solve arising problems in an interdisciplinary way. Especially the expertise of the more traditional sciences and fields is needed to understand the developments, and to lead them into the right directions that make this world a better planet for society at large. 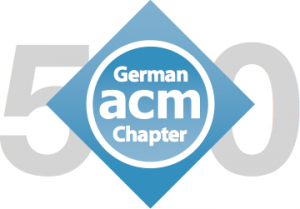 With the celebration of the 50th anniversary of the founding of the German Chapter of the ACM we want to shed new light to the question of human existence in the age of algorithms. We want to do both, celebrate the shaping power of computer science, and channeling and make the European voice heard even more in the ongoing global discourse on responsibility in the progressing digital transformation. As a highlight we will have the a three day celebration in Heidelberg at September 20, 21, and 22. Dr. Marc-Oliver Pahl is a researcher and teacher at Technical University of Munich. In his spare time he is also a photographer, designer, musician, and enthusiastic sportsman. Marc-Oliver leads the IoT Smart Space team at the Chair of Network Architectures and Services at Technical University of Munich. His research interests are in autonomous management of distributed heterogeneous devices including support functionality for managing IoT smart spaces, semantic abstractions, name-based management via P2P systems, edge-based IoT management, data analytics support, e.g. via machine learning or blockchain, use case implementations and testbeds. As second research topic he is doing teaching research focusing on developing new teaching methodologies, eLearning, and learning analytics. For his teaching related activities he received the prestigious Ernst Otto Fischer Award in 2013. Marc-Oliver is a professional member of ACM, IEEE, German Society for Informatics (GI), Deutscher Hochschullehrerverband (DHV), German Chapter of the ACM, and Faculty Sponsor of the ACM Student Chapter in Munich.